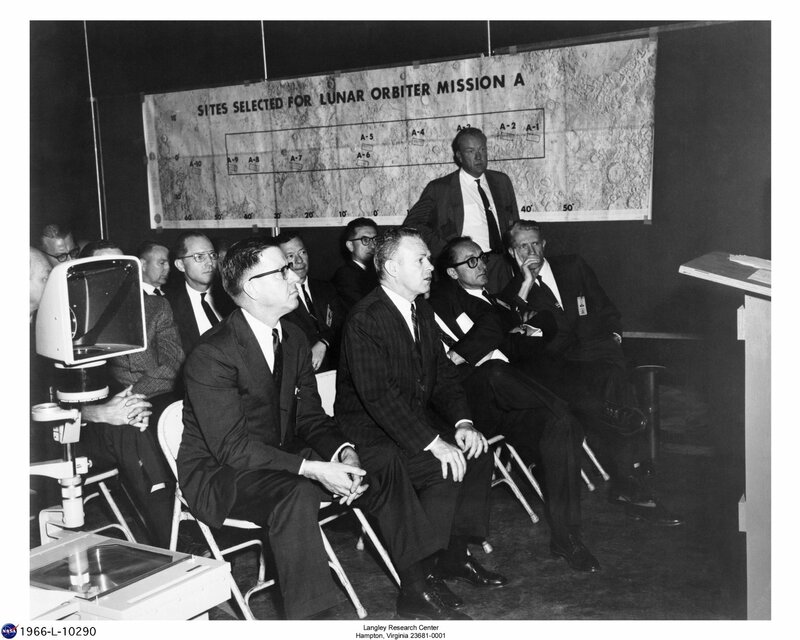 From Spaceflight Revolution: “Top NASA officials listen to a LOPO briefing at Langley in December 1966. Sitting to the far right with his hand on his chin is Floyd Thompson. To the left sits Dr. George Mueller, NASA associate administrator for Manned Space Flight. 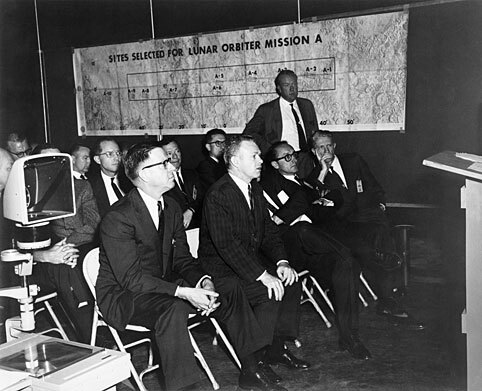 On the wall is a diagram of the sites selected for the “concentrated mission.” “The most fundamental issue in the pre-mission planning for Lunar Orbiter was how the moon was to be photographed. Would the photography be “concentrated” on a predetermined single target, or would it be “distributed” over several selected targets across the moon’s surface? On the answer to this basic question depended the successful integration of the entire mission plan for Lunar Orbiter.” The Lunar Orbiter Project made systematic photographic maps of the lunar landing sites. Published in James R. Hansen, Spaceflight Revolution: NASA Langley Research Center From Sputnik to Apollo, (Washington: NASA, 1995), p. 337.